The species is reliant on prey availability, which is often determined by woodland structure. In mixed forest, where the age of the trees and the structure of the forest is more variable compared to a homogeneous forest, the population of small mammals is also higher. Thus, in these kinds of semi-natural forests the species finds its food resources, while the decline of these forests threatens the survival this species. Locally, pesticide use, traffic and electrocution from powerlines also threaten this species. Preserving and maintaining mixed forests contributes to the persistence of this species. Thus, we will establish and maintain small glades and leaks in homogenous forest stands (e.g. Diósjenő, 82B) to enhance the recruitment of varying trees and shrubs. We will also create standing dead wood to provide suitable microhabitats (nesting places) for the species. 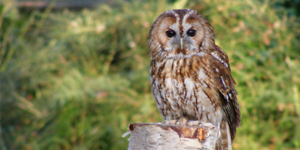 With the conservation of habits of owl we hope that we also contribute to the persistence of the Ural owl (Strix uralensis), which is a very rare and unique species in the region. BirdLife International. 2016. Strix aluco. The IUCN Red List of Threatened Species 2016: e.T22725469A86871093.